My name is Amanda Murphy and I’m a Quilting and Longarm Spokesperson for BERNINA. I wanted to share a new panel print that I designed to help teach free-motion quilting. It is available exclusively through participating BERNINA stores! I hope you like it! In my studio I sew on the lovely BERNINA Q 24 Longarm Quilting Machine but you can also use this panel to practice on the BERNINA Q 20 Longarm Quilting Machine or on domestic machines. I frequently teach both domestic and long arm quilting and think it is important to design for both. There is also a workbook available from participating BERNINA stores so that you can practice tracing some of these designs before quilting. I used Aurifil monofilament on the top of my quilt, with Aurifil 50 wt. cotton in the bobbin. With this combination, I haven’t had to adjust thread tension at all—plus it is hard to see my mistakes! If you are a more advanced quilter, you can fill in some of the smaller spaces between the motifs with loops, pebbles, stilling or whatever your heart desires! Directions to quilt these motifs and more can also be found in my new book—the Free-Motion Quilting Idea Book, which gives you ideas for how to place these motifs in actual blocks. The two products really work well together. There are actually two versions of the panel—the “training panel” is pictured above. It finishes at about 36″ x 52″. A smaller event panel is also available. It includes the simpler motifs and is designed to be cut up into placemats, pillows, or even made into a bag! Please share pictures with us on instagram using #berninausa and #berninalongarm, we’d love to see them. Even though Quilting BERNINA-Style: Free-Motion Quilting Panels look like finished quilts, they really ARE practice panels. So keep that in mind because, with quilting, you get better and better with time. I hope that these panels will make the process more enjoyable for you by helping you figure out which patterns are your favorites and how to travel from motif to motif for a beautiful finish! Stay tuned as I will share a few quilting techniques here on WeAllSew. 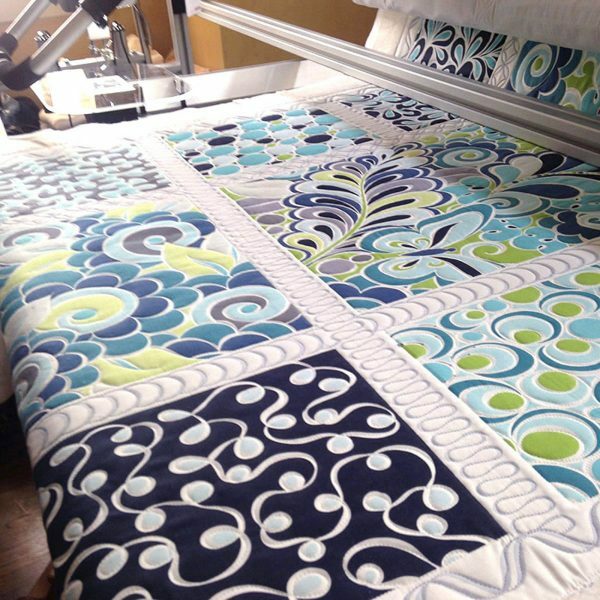 Which Free-motion quilting technique would you like to learn more about? A winner will be chosen on November 20, 2015 and announced later this month! I’d love to know more about ruler quilting on a domestic Bernina, and I also struggle with design. This is just what I need! Some guidance as I try free-motion quilting! I would love to know more about free motion quilting on 820 and frame. Thank you. Hope I am not too late. I sew on a domestic, so any free motion tips would be most greatly appreciated!!!!! Thanks! I would like to become a master in feathers and pebbles! I would love to learn more about Feathers! The technique I would like to learn more about? What a wonderful panel for free-motion quilting. 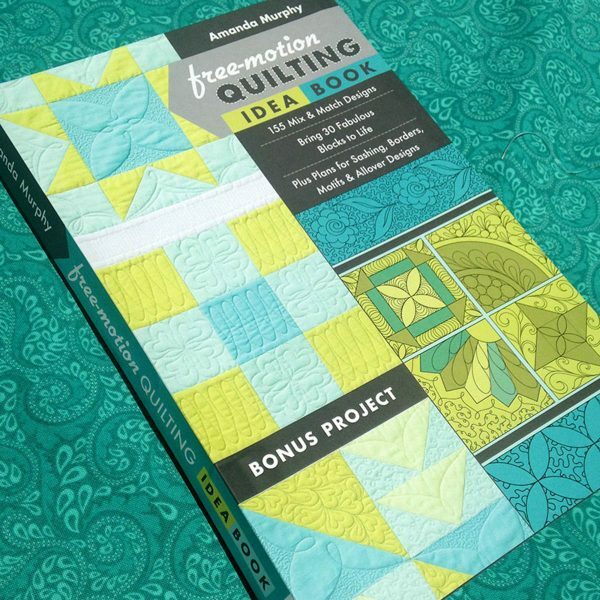 And your new book looks like it would be a great resource for anyone interested in learning/improving their FMQ skills. I have just purchased a new Bernina 580 and want to learn ALL I can about using the BSR as well as free motion quilting. This Bernina is all new to me! This is so cool, I am just now learning to do free-motion quilting. I would love any ideas and help available. Just can’t wait to start sewing this evening! I’d like to be able to do feathers more easily on a home machine. Also need ideas for different kinds of blocks. I would love to learn how to do free motion quilting such as the feathers. This would let me finish my quilt tops myself. I would like to learn more about using loops to fill in sashing areas. I need more practice in filling large spaces on a domestic. I can already stipple. I would love to learn to do small filler pebbles. Thanks for the chance to win this great prize! I just attended a Bernina Club on this very panel. I was intimidated by the BSR presser foot until I saw that this panel could help me actually learn to free motion quilt…and end up with a beautiful quilt while doing it! Thank you so much! I really like the idea of having it planned out and just following lines to learn free motion. I have always been afraid to try it. I think this would get me started. Love feathers & would like to learn to make them. I saw the panel in my Bernina store on Tuesday so it was very fun to read the article. I have not yet mastered free motion quilting but the BSR sure helps with my quilting desires. I like the thread suggestions and will try that soon but I would love some help in borders. I would love to learn how to make pretty feathers. I have tried free motion quilting but have not been that successful. Your book would be a great help and the panel is beautiful. I would love to have both the book and panel. Thank you for doing this. I don’t know anything except stitch in the ditch! I need to learn more about marking until I can do it without marking! I love your panels! I need to learn feathers and pebbles. I would like to learn more about quilting feathers. I have a Bernina 830e that I recently purchased used. I have done stitch in the ditch and stippling, but could really use some help learning to free motion quilt anything else! I have a Bernina 560 and have almost mastered some of the easier free motion stitches, but I simply can’t do a feather design. I use both regular free motion and my BSR. I just purchased a Bernina 880 and have so much to learn. I love the practice panel idea. Il have to look for it at my local dealer. I recently bought a Bernina 780 ( the most awesome machine I have ever had). FMQ is all new to me. I would love to learn to do feathers! I would like to know how to relax while learning free motion quilting. This would be a great way to practice. Also, will Bernina stores carry the book? I would like to learn more about designing quilting design to fill large open spaces in an interesting way. all of them, I send my quilts out to be quilted because I don’t feel I know what I am doing or how to do it. I welcome any exercise in FMQ. I have never done this type of quilting; but, I am wanting to learn. I love the panels! I am just beginning to try to learn free motion quilting. I know that I would love the book! I am still trying to master “Stippling” and I want to learn feathers and other patterns. I love my Bernina! I’d love to learn to do feathers on my quilts. Feathers have me completely stumped but I find them striking. I would also like to figure out flower designs that look like flowers. Soooo much I want to learn more of! Need help at not getting stuck in a tight spot and figuring out where I should be going! This looks awesome. I love the fabric and the free motion designs are ones that I am trying to learn. I need to start with the basics. It does look like fun! Just a beginner and would like to start with the basics! Other “practice” panels are not as attractive! Maybe this would help! Love this panel!! I need to increase my proficiency on curves, I am struggling getting the shapes and curves I want on my quilts. Would love to learn to long arm and make feathers!! I’m excited about the practice panel and your idea book! I’m a new FM quilter and need all the practice I can get. The panel has the designs I’m trying to learn and looks like it will give me great incite into the process. Trying to figure out what to put where is hard for me. I don’t have an artistic bone in my body, or my head! Pick me, I need you! Love my Bernina 550QE! What a great idea. I wonder if I can find this panel in Canada. I need help with curved designs. I love those panels! 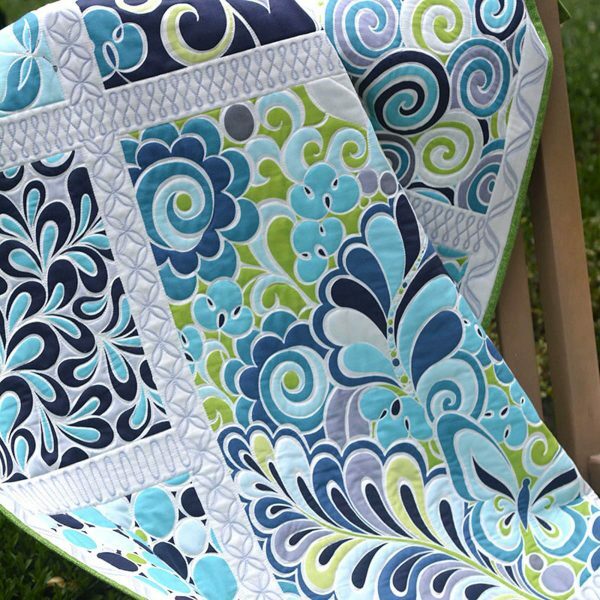 I am a beginning quilter and I would like to learn all about FMQ. I would love to learn how to make perfect feathers. I have not been very successful in my attempts at free-motion quilting. I really like the idea of this panel. I would like to know more about different filler/motifs to use, and the best place to use the different fillers/motifs. The panel is beautiful and that is a great idea to have it ready for machine quilting! Just purchased a new Bernina and would love to practice my machine quilting. This book looks like it will be an excellent resource. I really like the practice fabric which is more like working with a finished quilt. My biggest insecurity is in designing the final quilting plan for my quilt. We have 2 Berninas so that my husband and I can quilt at the same time. Thanks for this great giveaway! Would like to learn more about designing the quilting for the various sections of a quilt or other project. I’d love to learn more about quilting with rulers on with my 780. What a pretty panel and a great tool to practice long arm skills! I would love to see one on Borders! I want to learn feathers like everyone else, but I think I would use the flower pattern more often of I could master that one. I recently purchased a Bernina 550QE. I would love to learn at least the basics and have some practice. Then I’d like to expand on the quilting and learn to do all the beautiful quilting that you show in the book. I’d like to do free motion quilting but am too afraid:) Practice makes perfect! I too would love to become more proficient at quilting feathers. I love the elegant look they give a quilt. Beautiful panel, what a great way to learn and build confidence in your free motion quilting. I would love to learn more about fillers and how to mix them. I would like to learn more about different ways to do background fills to quilt a quilt so that the density is correct. I need to learn so much it’s hard to pick just one. But if I have to, I guess that feathers are the thing. It would be incredibly helpful to learn everything, truthfully. I have zero confidence in my ability to FMQ, and would love to use my 750QE to its fullest potential. I would love to start to learn any quilting stitch other than always stitching in the ditch. I’d like to learn more about quilting on my 830 and how to do it with out getting puckers on the back. What are the secrets! I love your projects! I love the practice panels, too. Ingenious! I am new to quilting, so all quilting techniques tips are great. I love the curls and swirls in quilt stitching. I would love to become more confident and have control over my free motion designs and techniques. This book and the panels look like something that will help me improve! And I like the panels, too. Great idea! Would love to able to turn corners with feathers on borders. Wow what a pretty material and color. I would love to win this and learn to “feather” quilt. I’m always interested in learning more. I would like to make feathers, pebbles, and learn different fill-in patterns. I have always wanted to learn free-motion quilting using my Bernina 440. The panel and book are an ideal way to learn these techniques especially with the starting points already printed on the panel…how cool is that?!!! Would love to learn how to do the feathers more elegantly. Great panel! I would like to learn when to use the BSR and when I don’t need it. The answer to this question is easy. All of them! I have just started playing around with free motion quilting. I really need to know more of what kinds of threads to use. After I find one, what type of thread do I use in the bobbin so that there is not too much thread build up on the back side. I have just purchased a Bernina 710 and I also purchased the BSR. Looking forward to taking classes so that I can learn what the BSR is capable of. Then I want to start learning how to make feathers that fill in the specific space that needs to be quilted. Can you tell which mode of the BSR foot works better for certain free motion designs or fabrics for free motion design? I can do stitch in the ditch. 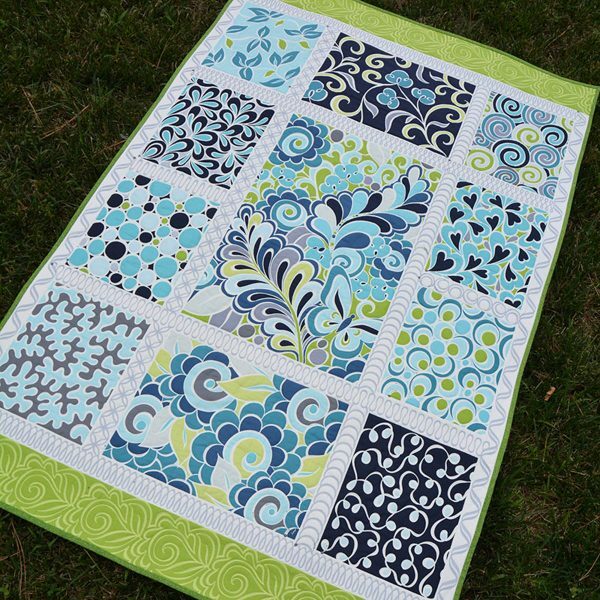 I’d love to learn how to do the sashing and border quilting. I have a Bernina 820 and really enjoy free-motion quilting, but would love to learn more and want to become more fluid. I so very much need this book, so scared to even try free motion and screw up what I have accomplished, love the creativity of free motion. I only do stippling and meandering quilting so I would love to learn many different kinds of quilting. 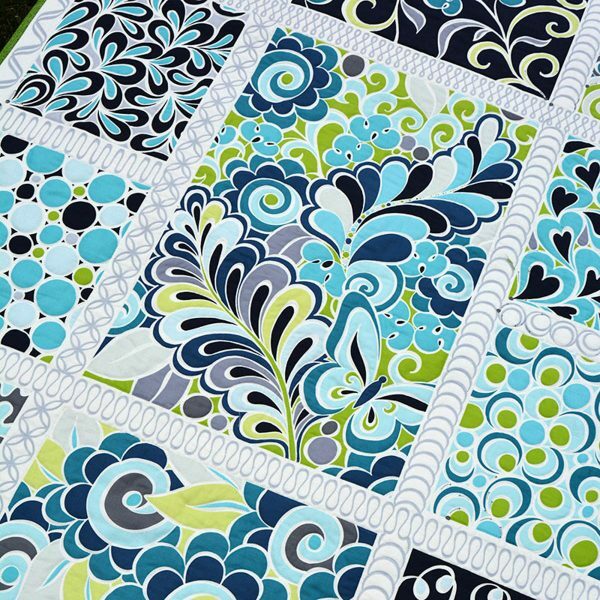 Thanks for the great giveaway and for sharing about these quilting panels. I’m anxious to learn more about ruler work. I also need a lot more practice creating feathers. I can’t seem to get the right shape with free motion. These panels will help a lot! 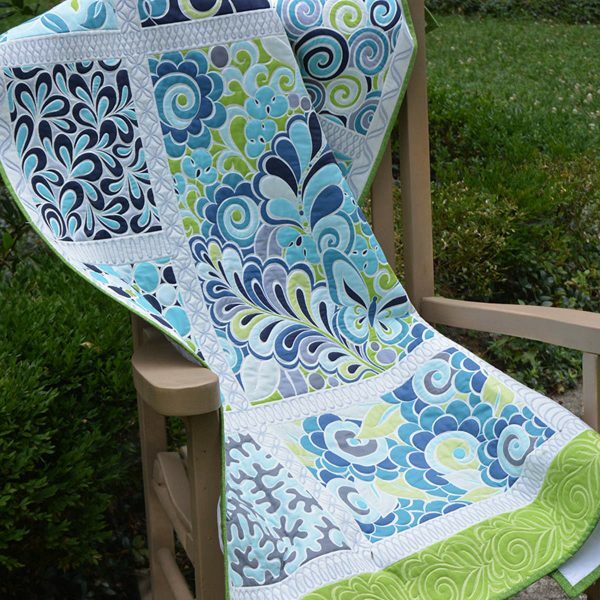 What a great idea for practicing free-motion quilting! I would like to learn and perfect feathers. Thanks for the opportunity to win this package! Oh boy, I need all the help I can get!!!!! I would love the book to help me learn how to do FMQ. OK, I know I need to practice, and I need to find someplace to get the panel to help me. Fingers crossed. I would like to see ruler work on the 7 or 8 machines. I know people are using various feet from other manufacturers. I’d like to see a Bernina specific foot and advice on using it. I can stipple but struggle with other things. I would like to learn how to make continuous feathers. I have not tried an all over motif on a large quilt. This is a great product . What a pretty panel! I’d like to tackle free motion feathers. I need more practice to actually do them on a quilt. Thanks for the chance! I would love to learn better control. I do not have a BSR and have a tendency to be erratic with my stitches. Would like to learn Sashiko patterns. This is an awesome book and the practise fabric is an inspired idea! I have always had problems with making my feathers look great! HI,I like what you did with the panel! I’m a beginner FMQer so I want to start on hearts, like trailing hearts. Thank You for giving a copy of your neat book! I can use some improvement in my feathers. I’d also like more ideas for background quilting. Beautiful panel! I want to learn how to get the spacing better with stippling, both large and small. I also want to learn how to make better feathers. I have just started learning to free motion quilt & would love to learn how to do something besides meandering! I just bought a new Bernina two days ago…a 570QE! This will be so helpful in learning what I need while using my new machine. What I’d like to learn how to do is make those fun curved cross-hatched designs. THANKS for the contest. Happy Thanksgiving! I am a newbie and would love to just learn the basics of free motion quilting. Thank you. I just love the panel. Perfect for doing all kinds of free motion. Would live to learn all of the motifs you have shown. They all look fabulous. I would love to learn how to free motion. I am a beginner quilter and love the idea of doing my own designs. I would like to learn more to do with free motion quilting. The panel looks great for practice and beyond. Your book looks like it would be very helpful. I would love to learn how to free-motion quilt concentric circles. It looks so great! This looks like something I would use. I am a beginner home machine quilter and need all of the instruction I can get. I would love to learn about concentric circles. I can now manage a basic stipple, thanks to my BSR, but I’d love to figure out how to progress to more variety in free-motion quilting on my domestic machine. Particularly, feather motifs. I am calling my dealer tomorrow. I have just started free motion quilting and this is so beautiful! It’s like a double bonus, beauty and practice, who could ask for more, and of course, who wouldn’t just love to win that book!?! I just purchased my first Bernina and I have named her Belle. I’ve ot a Girl Crush. I love her and she is my quilting queen. I am so happy to be part of the Bernina family!!! I love the concentric circles and the feathers are simply fabulous! Wow, the answer would have to be all of them. Can you tell I’m a beginner? Would like to learn free motion feathers and love the idea of making my own designs. I would like to learn how to pick the right free motion design to complement my quilt. Your designs are beautiful. The technique I need to learn more about is permission to make mistakes, oh and feathers. I know I am too late for the giveaway but still wanted to say that I think these panels and the book are a great idea. I love this idea! I’m trying to learn and this is a great tool. Pingback: How To Quilt Feathers including Handout for Practice • WeAllSew • BERNINA USA’s blog, WeAllSew, offers fun project ideas, patterns, video tutorials and sewing tips for sewers and crafters of all ages and skill levels. I’d like to be able to center flowers in the squares on my quilts with my Bernina 780. I am new at quilting and I know I could mark the center but is there a way that you can just figure it?